As you guys requested, here’s a new fashion post! As you guys know, my dress code at work is extremely casual. But, every once in awhile, I feel like dressing up. I’m lucky with my work environment that it’s not looked too oddly upon if you dress up too nice or too casual, like what I’ve experienced at most offices. Here’s an outfit from one of my dressy days. This blazer comes from my first big girl suit. You know, the one you buy right around or after college graduation when you’re trying to score your first job. I opted for a really traditional suit style at the Brooks Brothers outlet, but I’ve hardly worn it since getting my current job. I’ve considered the blazer too formal and oversized since I prefer more cropped blazers. But, I’m coming around to the oversized blazer look. I really like how it looks paired with skinny-legged pants, which I think help make the blazer more modern. I decided to try to both dress up more casual items (khakis and a t-shirt) with more formal items (a classic black blazer and black pumps). The result turned out to be one of my favorite, recent work-looks. Reader question: How is your work environment? Do you feel weird when you dress too casual or too formal? Lol! I take the photos whenever I have free time around the right time of day (when the lighting is good). Sometimes I take them whenever I can regardless of lighting. The outfits are definitely more difficult because I have to figure out where to take them and then depend on natural lighting. I can fake it more with the food photos! lol 😛 Thank you! I love this whole outfit! Love! Cute outfit! I’m a med lab tech so I live in koi brand scrub pants (they look like khakis) and t-shirts. I don’t like scrub tops cause they are so boxy on my 4 foot 9 body and it looks less like scrubs when I wear a t shirt. It all gets covered by a protective gown anyways ha. 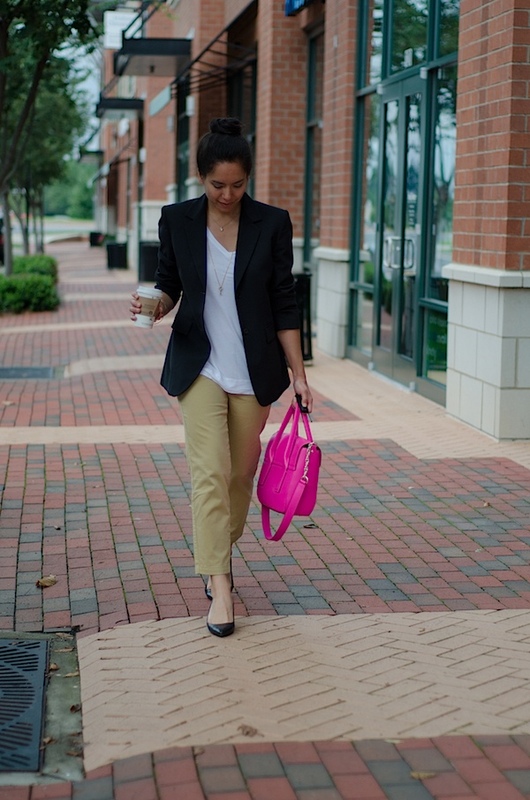 Great look and the pop of color with the bag – fabulous! I’m going to try and use my big girl suit blazer in an outfit. I never use mine either. Love it. The pink really pops! I’ve never figured out how to wear a blazer. I love this look! Can’t beat a classic white tee with a modern twist. Agreed! 🙂 Thanks, Sarah Ann!